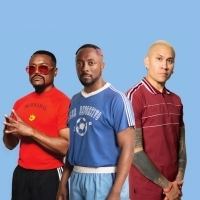 Black Eyed Peas are American hip hop/ pop group formed in 1995, featuring founder members, Will.i.am - vocals/ piano, Apl.de.ap - vocals/ drums and Taboo - vocals/ DJ. Long-time member, Fergie left in 2018. They released their debut album, "Behind the Front" in 1998, followed by: "Bridging the Gap" (2000), "Elephunk" (2003), "Monkey Business" (2005), "The E.N.D." (2009), plus 2010's: "The Beginning".